In 2012, Initiative for Multipurpose Prevention Technologies (IMPT) managed an exercise to define general target attributes for MPT products. While prioritizing specific MPT product dosage forms (i.e., long acting injectables, intravaginal rings, and on-demand products), it became clear that it was necessary to move beyond a listing of general MPT product attributes and to develop more specific TPPs focused on each type of prioritized product dosage form. These dosage-form specific TPPs focused on defining the necessary attributes and required supporting data for the successful development of impactful MPT products. 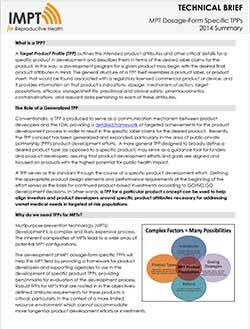 Learn more about TPPs and the development of the MPT Dosage-Form Specific TPPs by reading our TPP Technical Brief.